Everything was working fine until just recently when suddenly everytime I enter full screen mode my computers resolution drops down to the lowest possible resolution. If it matters to know, my screens resolution is set to 1400x1050 (the highest for this laptop) and it drops to 00x600 (the lowest) for full screen mode. I have tried reinstalling both the game and the english patch and the problem is still there. The rest of the game works fine and this isn't causeing any real problems, it's just that I like using full screen for games and with things as they are now the windowed mode screen is larger than the screen for full screen. Sounds like a power management issue with your tablet. I had a similar issue with my laptop recently (had to reinstall windows) - just had to set the power settings to my preferences again which I forgot to do after the reinstall and it was all sweet. I run Vista; I can't really exactly tell you what to do and where to change the power settings at... I would suggest tweaking some power management settings first, and just playing around from there. It will probably run in the settings that is mot suitable for playing. sushimonster wrote: From your question, it seems that your tablet remains at 00x600 after exiting FSN from full-screen? If that's the case then ignore what I said. Sorry I didn't reply sooner. While messing with the power settings did not affect the game in any way, I just happened to check a few other things right after the power settings. Among them I found a few things in the graphics options I must have missed before. I checked the aspect ratio and found that it was set to "center screen" rather than "full screen (no border)". Chances are I was just messing around with the graphics one day and when I found that changing the aspect ratio had no immediate effect I must have compleatly forgot about it and never bothered to set it back to normal. Thanks for the replies. By the way, when exiting the game my resolution did go back to normal. It only changed during games. Well, I only checked with F/SN and ragnarok online as the other couple games on this laptop need to be reinstalled, but I'm guessing they would also have been affected. Now, I realize this might be a WINE bug, but I thought I should bring this up anyway. Whenever I get to the scene where Rin uses her second command spell to save Archer, following Saber pointing her sword at her, I get a blank error message as soon as the screen fades to white. By "blank" I mean it contains no text other than an "X" for closing it and an "OK" button. The game stops running, though it does not crash. I am able to access the menu, but not continue the game. Like I said, this is likely a WINE bug. If there's no solution at this point, could someone please open the save for me where it works, move one click ahead, save, and send it back? My FSN saves, uploaded on sendspace. Second save slot has been saved AFTER error message, though reloading that very slot instead returns to the beginning of the effect (fade to white), which reproduces the error. I just installed this game and when I run the new patch, it failed to extract after it scans the 3rd disk. Here's the screenshot. Do I miss something? I kept on repeating the installer still the same results. AzureMoon wrote: I just installed this game and when I run the new patch, it failed to extract after it scans the 3rd disk. Here's the screenshot. Do I miss something? I kept on repeating the installer still the same results. You are not allowed to use our translation on an illegal copy of the game. Buy the game, or don't play our translation. Not sure if this is the correct place to post this, but I cannot get it to install in Windows 7 at all. I've tried running it in compatibility mode, and "Run as administrator" mode, but it makes no difference. Not sure about the 32-bit version of Windows 7. Also, it's the full version of Windows 7 I'm using, not the RC or any of the betas (Got it through MSDN). I know you can't do anything about it right now, more of a heads up for when the full version is release publicly, and to see if anyone else is having a similar problem. Ryuuka wrote: Not sure if this is the correct place to post this, but I cannot get it to install in Windows 7 at all. Please state what exactly is not working, and how it fails. "File extraction failed. The game will not function properly unless you restart the installation procedure. Are you sure you want to continue?" If I continue, and try to run the game, I get a with a blue background and an empty error box. Ryuuka: By using our translation with an illegal copy of Fate/stay night you are in breach of the F/sn English EULA. If you payed for this copy, you've been cheated. You are only allowed to use our translation with a legal copy of the game. I got it from eBay, but I'm fairly sure it's legit, had no trouble installing it in Vista or XP. EDIT: Managed to get it working. Tried again and for some reason, running it in XP compatibility mode worked this time. None of the compatibility modes made any difference last time I tried. Ryuuka wrote: I got it from eBay, but I'm fairly sure it's legit, had no trouble installing it in Vista or XP. That's curious... Your problem is very specific for the warez CD version of the game, but it would happen regardless of the OS. It's probably just a bug in Windows 7 or something, there seem to be quite a lot of small glitches with the compatibility mode, probably due to that new "Troubleshoot compatibility" thing. Hopefully it will be fixed eventually. Location: Trust me.... you DONT wanna know. "We want a game that's going to chop us the second we screw around, or just flatten us at its whim... until we finally beat it. They demand more of us, and we rise to the occasion because we're that good. And that feels good. And that's why we game." I just installed the game successfully yeseterday with the english and voice patch. Everything went smoothly in the game during the prologue until just after the scene where Saber appear in front of Rin. After that the game crash with series rapid screen displays and then the game return the to the main menu. How should I fix this problem? I would greatly appreciate any help. I'm getting some weird bug with the game. The text in the game doesn't slowly appear (like if it was being typed and whatnot.). It just plops out on the screen instantly, and stops the voices from playing. It's like it skips the sentence, and I dunno how to fix it. Ryuuka wrote: It's probably just a bug in Windows 7 or something, there seem to be quite a lot of small glitches with the compatibility mode, probably due to that new "Troubleshoot compatibility" thing. Hopefully it will be fixed eventually. Before installing on x64, right click the English patch, go to the compatibility tab at the top, tick the run as admin box, and run under Vista Sp2 compatibility. Did a clean install from a x86 Vista Business to a x64 7 Pro. 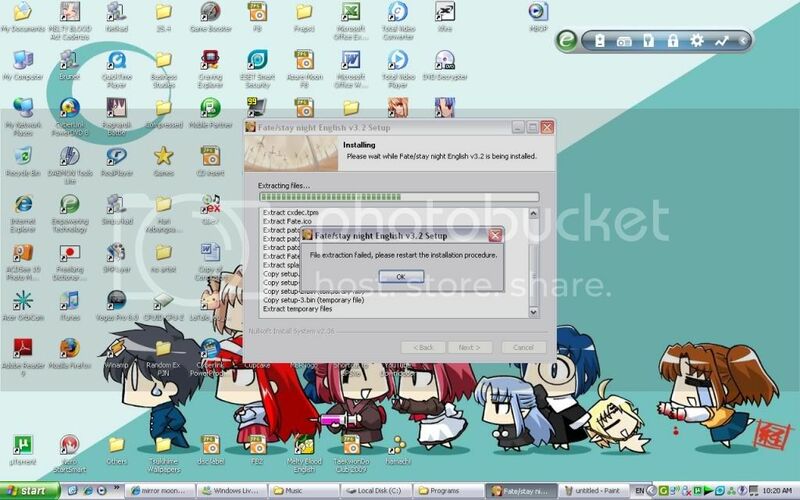 The FSN installation on Vista works without problems, that is, it saves in Program Files. In the other hand, with x64 Windows 7, it goes into the virtualstore folder instead (nothing in the program files folder). At the moment though, moving all my old saves into virtualstore lets me play them without problems, so I guess that is good. message will probably remember me a few months back posting a laggy nVidia 9300 graphics problem (and you told me to get a graphics driver update, to which I quoted something about nVidia's heat issues). On a more detailed analysis, when I choose to EXIT full screen, I can see the menu bar at the top fully extend horizontally before returning to a window mode. This is with both nVidia and Intel. So I am thinking this maybe solvable with a few tweaks......? Tried uninstalling and retrying the whole game up to that point but I still get the same error in the same point. EDIT Nevermind. Fixed the problem myself somehow.